Maybe you just need to run a weekly segment on the awesomeness that is the Bulletman comics. I hope you have more issues handy. Thankfully there are still many issues to go through on the Golden Age Comics site, so we’re in luck. I know I need to mix it up with some other stuff, but there’s just so MUCH to love in these Bulletman comics! I mean, where else are you going to find ninja Nazi stealth tanks, I ask you?! I just thought it was funny that the opening line of a highly publicized play was “Ooo, people are asleep!” Not exactly gripping drama. Isn’t that guy supposed to be Dead, rather than asleep! I love that the play isn’t well-liked, or famous, or even highly anticipated… just highly publicized. Oh I love this “plav”. 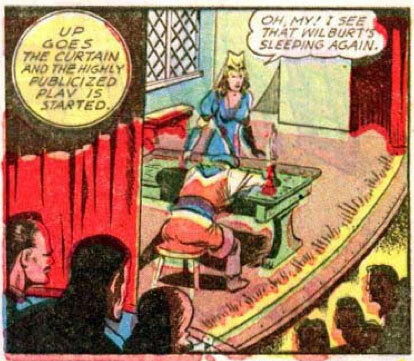 In the next scene, Hunchy Winthrop puts the candle out and says, “He sleeps forevermore, My Lady.” Bravo!